The rants, raves, tears, and joys of a baseball fan named Dave. Former Texas Ranger Gerald Smiley Giving All Kids A Chance To Play Ball! 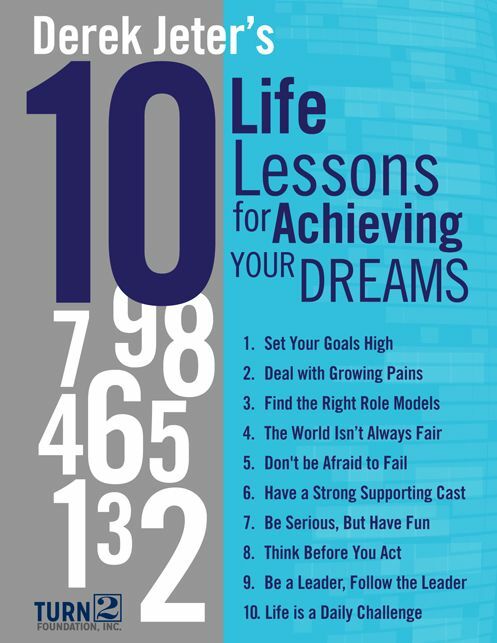 In The Life You Imagine: Life Lessons for Achieveing Your Dreams, Derek Jeter lays out his top 10 life lessons. These are wonderful guidelines that can apply to everyone. Here is my take on each of Jeter’s life lessons. Always set your goals high. If you don’t dream big and set goals to accomplish your dream, then you will be disappointed. The quote by Antoine de Saint-Exupéry,“A goal without a plan is just a wish,” applies perfect. Derek does not want you to wish for things. He wants you to make that wish a goal and work for it. My goal is to be a journalist covering baseball one day. I hope my plan of creating a name for myself through this platform can help me accomplish my goal. The road to success will never be easy. There are always bumps on the road. Derek Jeter had numerous slumps throughout his career, but he dealt with them and got back on his feet. Mistakes carry value. It’s where we learn, build upon ourselves, and get better. People are always going to doubt you. Sometimes they are threatened by your potential. Harness that doubt and negativity into positive energy. When someone doubts me, it only fuels my fire to become a better player, writer and person. It’s all about the attitude we posses when confronting our growing pains that ultimately helps us deal with and overcome them. Role models can be crucial to one’s success. They are someone you can always go to for advice and help. Some people may not have any role models they know personally in their lives, so they may look up to their favorite star as a role model. This is why I feel it is of utmost importance for “stars” to lead by example. We are all watching and many follow in their steps. Some huge role models of mine are my parents, coaches, friends, and siblings. They are my number one fans and will always be there for me through thick and thin. Another role model of mine, a friend I made though my platform, is Tom Pipines of Fox News. He has taken me under his wing and I’m grateful for his mentorship. Pip is always there for me. The worst of things can occur to the best of us. Only focus on what you can control and strive to be the best in it. Who better to tell us this than a superstar in the game of failure? If all we did was succeed, do we truly know what success is? Our worst of times, bring out our best. Failure is a constructive obstacle that makes success more fulfilling. Failure is our opportunity to learn, improve and challenge ourselves. I have never been forced to like or do anything by my role models. I have been able to discover my identity on my own with the unconditional support of people around me. You can’t reach your dream by yourself. It takes a village to raise a star. Another way to look at a strong supporting cast is competition. Look at others in your prospective field as friends, but also as competitors to challenge you. Most importantly, STAY AWAY FROM THE HATERS! If you want to be successful in whatever it is you want to do, it has to be taken seriously. Work harder than anyone you’re competing with. Understand the task at hand and do everything you can to accomplish it. If you have a true love and passion for what you desire, the fun should come along with it. Nothing is more fun for me than baseball practice everyday and writing countless number of articles to share. Everyone has heard that if you love what you do, you’ll never work a day in your life and it has to be true. However, as soon as the fun is lost, everything goes down with it. Work becomes a chore and motivation is lost. You start to “go through the motions.” Maintaining that fun, love, and passion is crucial to a happy successful life. Showing the traits of leadership will help you rise in the eyes of others as well as the ranks of your job/task. This certainly includes, but does not have to mean a vocal leader. Actions speak louder than words. Coaches will always notice heart, hustle, and attitude and they will eventually be rewarded. Derek Jeter was one of the best “lead by example” types out there. Not once did I ever see him not hustle and his heart was always undeniably in the game. Another part of this lesson from Jeter, is to follow the leader. This can be taken two ways. One way is to follow in the footsteps of a role model. Another is, until you are at the very top, there is always someone above you to look up to. It is always very important to respect a superior. It will pay off in the end. Every action has a consequence, good or bad. Ask yourself, is this good for me? Is this going to help me accomplish my goal in life? If the answer is no, it’s probably something to avoid. We must all control our impulses and focus on the bigger picture. Every day we are met with challenges. There will always be good and bad days. Life is not easy, but we if we attack it with the right mindset and work ethic, we might just be up to the challenge. February 2nd, 2017 1 Comment	MLB Today	David S.